Ever walk long distances in the wrong pair of shoes? You know, those times you left the house with no real intention of doing any type of real activity and then found yourself walking far further than you prepared for? Remember how your feet and even your knees and hips felt afterward? Now, would you go running for hours every night in those thin, shabby excuses that you believe even pass for shoes? Didn’t think so. Now, try think about your mattress as being the same kind of support that your shoes are supposed to be. If you’re sleeping on an old, worn-out, non-supportive mattress, it’s causing the same type of damage to your body every single time you lie down. Just as runners retire their shoes after so many miles in order to avoid stress and injury, you should retire that old mattress. According to a research study, performed and published by Bed Times Magazine, 62 percent of study participants reported improved sleep quality and almost 71 percent reported improved sleep comfort after buying and sleeping on a new mattress. More than 55 percent of participants also stated that they experienced reduced back pain, while just over half said that their back stiffness had lessened over a four week period. Plenty of restful sleep is recommended by all health experts as physical, mental and emotional processes are all negatively effected when quality sleep is not attainable on a regular basis. 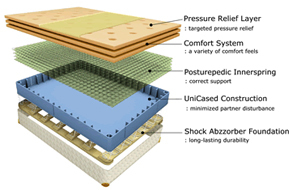 These findings strongly suggest that new, supportive mattresses are imperative to a good night’s sleep; allowing people to function at optimal levels at work, with family and during play.